Research by a member of the Engineering Club led to a last-minute amendment to the resolution. “I will make a motion to approve, but with an amendment,” said Chris Camacho, vice president of the Engineering Club. “Based on research, if recycled packaging isn’t put in a biodegradable landfill, it will not decompose. At this time, all waste products from OCCC’s food service area go to the Oklahoma City landfill. The Leadership Council is the college’s equivalent of student council. It is comprised of representatives from each college club, plus several at-large members. TLC has worked for more than a year and a half researching ways around the use of non-biodegradable Styrofoam to-go boxes at the college. 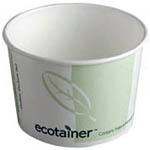 Until biodegradable products are used, some TLC members recommend that customers ask to have their food served on plates that can be washed and reused. Jorge Krzyzaniak, with Advocates of Peace, said biodegradable packaging offers a number of benefits. “In production it’s treated very differently, so it’s not like Styrofoam,” he said. Kenneth Meador, with the College Democrats, concurred. TLC co-chair Annalyn Gill applauded the outstanding research of the Engineering Club and thanked Camacho for bringing it to the attention of TLC. Marion Paden, vice president for Enrollment and Student Services, and Erin Logan, director of Student Relations and TLC sponsor, worked with representatives to create wording that reflected the concerns of OCCC students to transition to more eco-friendly packaging. They designed phrasing that articulated the need to handle the packaging according to manufacturers’ suggested recycling methods. The eco-friendly dining services resolution will now go to OCCC President Paul Sechrist and other cabinet members for review before a final decision is made. The issue of increased cost to diners was one concern TLC members voiced in earlier discussions. For more information, contact TLC at http://occc.campusgroups.com/tlc.